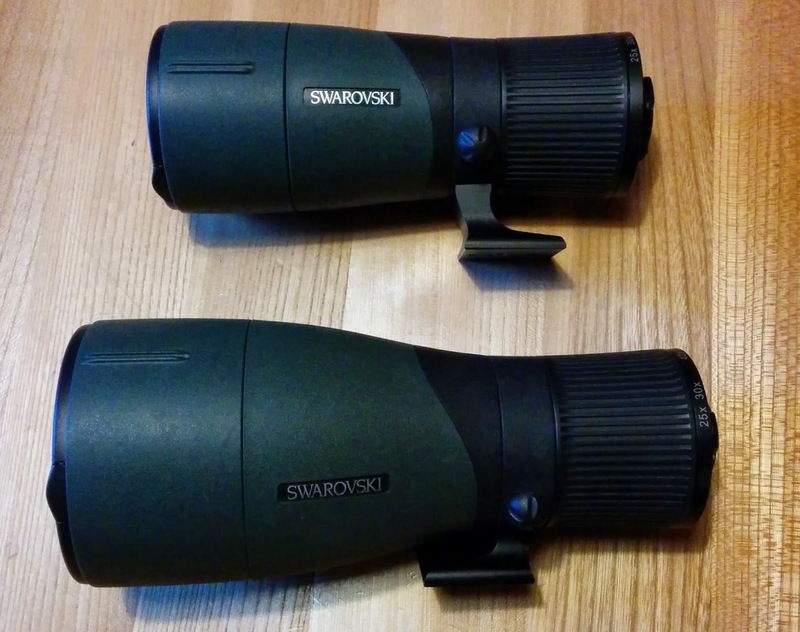 Swarovski's modular spotting scope system ATX/STX allows you to interchange 3 sizes of objective lenses with one ocular. The oculars are also available in angled (ATX) or straight (STX) versions. The objective sizes are 65 mm (25 to 60 power zoom), 85 mm (also 25 to 60 power) and 95 mm (with a whopping 30 to 70 power zoom). The objectives have the further advantage of having the zoom ring right next to the focus ring of the ocular... no more fumbling between the two when focussing and zooming on a distant subject. I have been testing the ATX for several months with the 65 and 85 mm objectives. My main focuses are identification, observation and digiscoping with a compact digital camera (both photos and videos). 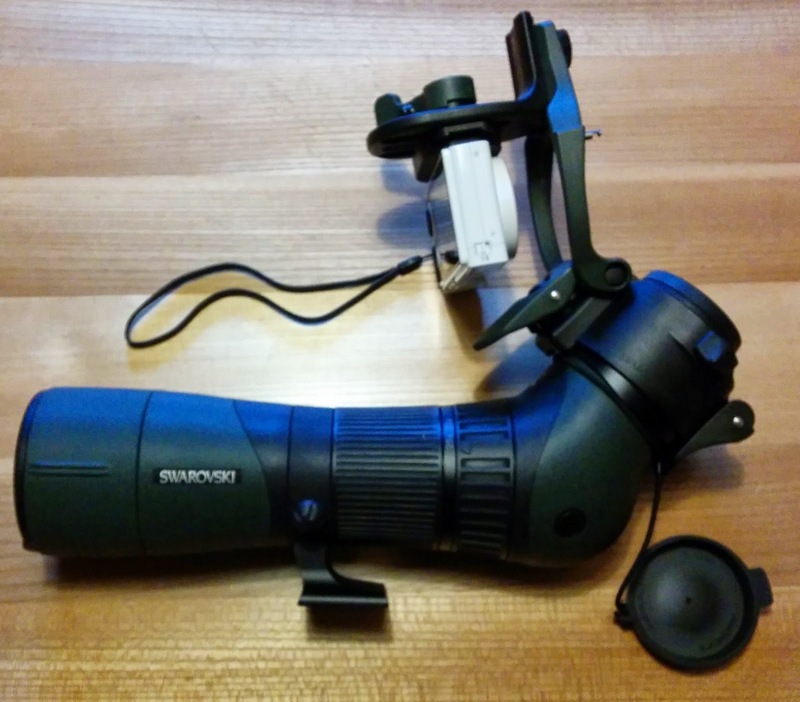 For this I've been using the DCB II digiscoping adapter. 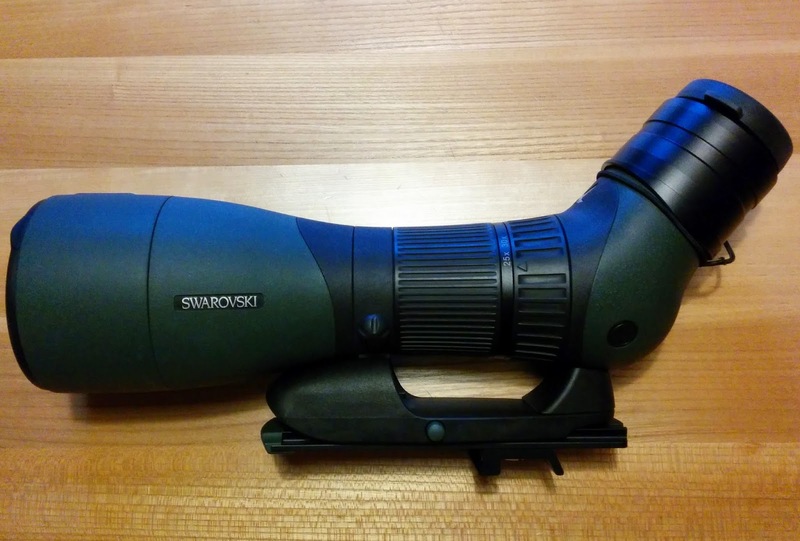 The great advantage of this adapter is that you can easily fold it up out of the way to view through the scope. Once you've attached the adapter, there's really no reason to ever take it off again even if you switch objectives. I walk around all day with this setup (plus tripod) on my shoulders. The only reason to take the camera off the adapter is when the battery runs down and you change to a freshly charged one. The advantage of a larger 85 mm (and 95 mm) objective lens, of course, is to allow more light to reach the eye under suboptimal lighting conditions. The 65 mm lens is so good, however, that for me the advantages of lighter weight and less volume mean that I usually leave the 85 mm lens at home before leaving on my hours-long treks, often in mountainous terrain. The 85 mm objective lens alone (without the ocular) weighs 1.15 kg (2.53 lb.) compared to 0.84 kg (1.85 lb.) for the 65 mm lens, a difference of 0.31 kg (0.68 lb.). 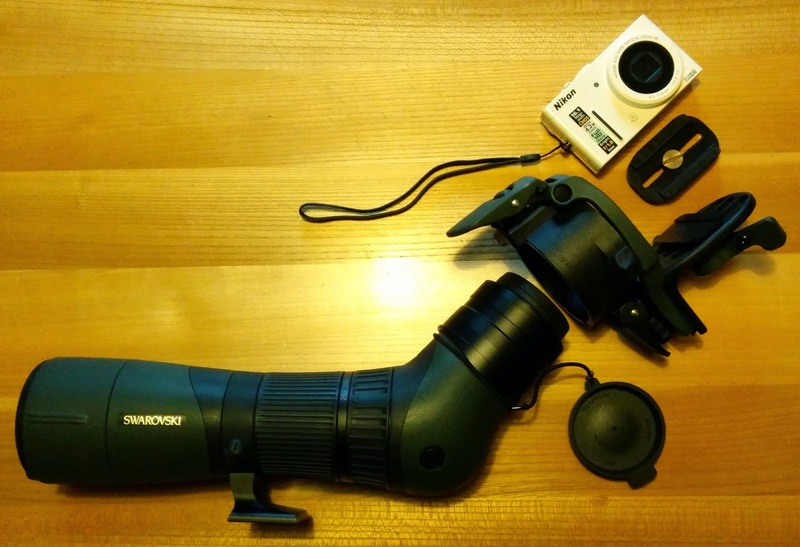 With practice changing the objectives is easy, but since this is the part that attaches to the tripod, you have to change two attachments every time (the attachment to the tripod and the attachment to the ocular). Therefore, unless the lighting conditions are really bad and I won't be walking around too much, I would stick with the 65 mm lens. Your mileage may vary. Another piece of optional equipment is the balance rail, the reasoning behind which is that the added weight of the camera will make the ocular end of the scope heavier, causing that end to tip down. In the photos the foot on the balance rail is closer to your body (and the camera) than the foot on the scope. With a push of the green button on the balance rail you can easily slide the center of balance to any desired position. The balance rail fits both the 65 mm and 85 mm (and presumably 95 mm) lens, but not without considerable fiddling. This is not meant to be done in the field. The balance rail is much more sophisticated than in the ATM system. Swarovski obviously put a lot of thought into it, but it adds 0.34 kg (0.75 lb.) to the system. At first I thought the problem of the camera tipping down when you least expect it would be larger. Admittedly I've gotten into the unconscious habit of tightening the corresponding knob on the tripod before taking my hands off the positioning handle. And with compact digital cameras becoming more and more compact and lightweight, this is becoming less and less a problem. The tripod head I tested with this system was a DH 101 and the tripod was a CT 101, the same as in this blog post, so I won't go into further detail. 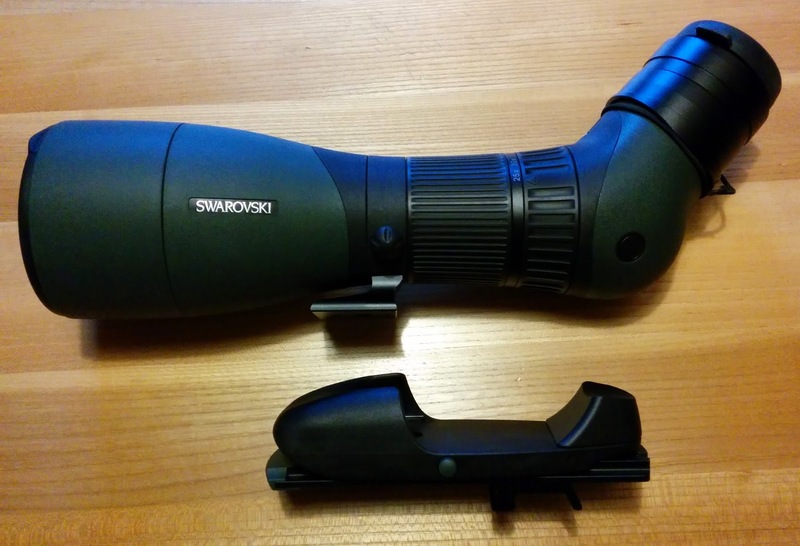 As you can see the Swarovski ATX/STX spotting scope system is truly modular to fit any need. The total weight of this system is about 4.5 kg or 10 lb. as measured by my luggage scale, about the same as my previous system. For photos made with this system see my previous post and my Flickr Photostream. For videos, see my YouTube wildlife playlist. I own a Nikon D7000. 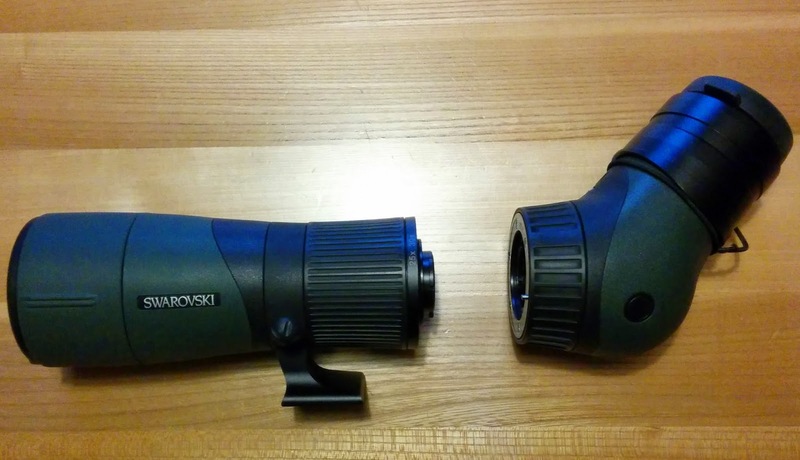 Will these Swarovski spotting scopes be compatible with my Nikon? Hi Robbin, Liked the post. The first sensible one I have read about using the ATX modules in the field. 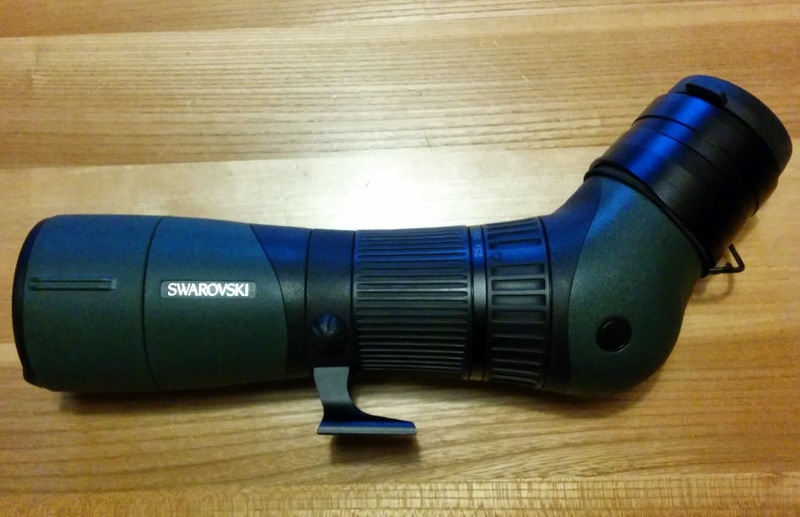 Most birders just blather on about the Swarovski optics and never explore practicalities like weight, or even how to carry the kit. I'm thinking of buying the 65 and 85 myself. At 68 years of age, weight is a prime consideration. 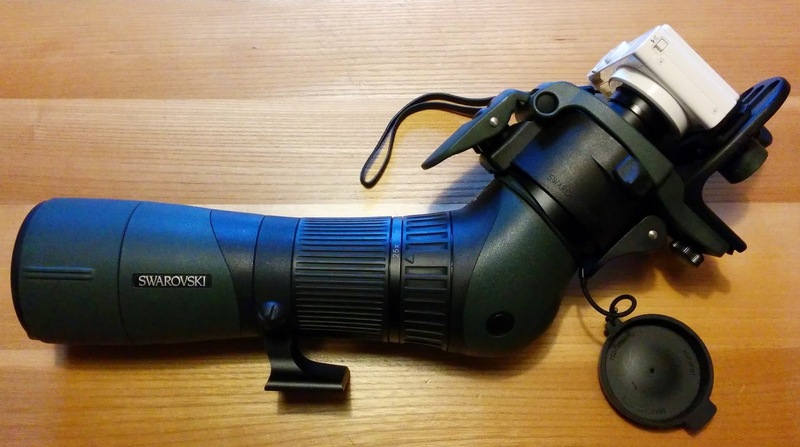 I find my 8.5x42 SV's get heavy after a day's birding, so I view the whole scope/digiscoping thing with some trepidation. You don't mention in what way you carry the kit when climbing or walking: over your shoulder or in a back pack for later assembly. Do you know the Multipack from Cley Spy? They are a Norfolk birding retailer. It would probably be my pack of choice as you can carry the scope + DH101 head + tripod as one assembled unit. You just unhook the kit it from the back pack, adjust the tripod and away you go. Thank you for a very useful blog. Thanks for your comments, Bruce. When I climb up mountains I usually have the scope and tripod unassembled in my backpack till the first time I use it. Then I carry the assembled set on my shoulder. It's not very practical and even stripped to the bare essentials can get heavy, but I haven't looked into dedicated scope/tripod packs because I always thought they wouldn't have enough room for my other "needs". I didn't see a Multipack on the Cley Spy site, but I saw a Mulepack. Is that what you meant, or did they carry a Multipack once and have discontinued it?